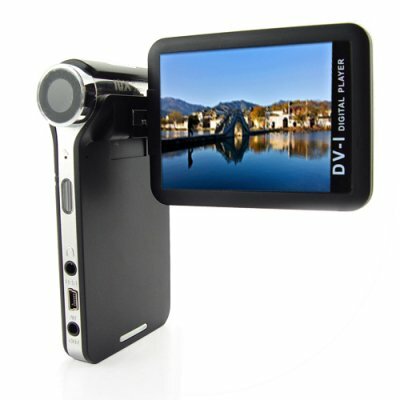 Successfully Added 4GB PMP + DV Camcorder - 2.5 Inch Swivel Screen to your Shopping Cart. Portable media player and digital camcorder camera mix with a massive 4GB of internal memory and a beautiful 2.5 inch LCD swivel screen. Nice pocket-sized digital media player with a 2.5" LCD swivel screen that also doubles as a high quality DV camcorder/camera. With 4GB of built-in flash memory, you will little worry about storage for your media or self shot movies, and coming in a convenient, compact form factor, this quality multi media player is further enhanced by a powerful feature set that provides versatile functionality for the user: take great still shots with the 2.0 megapixel digital camera, record digital video with 320x240 resolution or play a variety of digital media file types. The digital multimedia player handles all of your audio files effortlessly with the built-in speaker or powerful 3.5mm earphone jack. Tired of your music? Then how about watching your digital movies on the video player, or use the image viewer to enjoy browsing your favorite photos. The choice is yours! This is a great portable multi- media player with a clear and vibrant 2.5 inch LCD screen for use when commuting, traveling or walking. Do yourself a big favor by stocking up on this new item to sell at your physical / internet store or feature it in your latest online auction listings and use our blind drop shipping service to maximize your limited resource of time. on 2009-12-10 06:08:45 it's nice! great product.nice quality video, mp3 and easy use.Fast delivery.Thank you again. on 2009-06-27 11:04:52 A cannon shot. I shot this video where I would not put my eyeball. Its 1100 gr. of black powder stuffing rags in a hardwood log. I thought it was a pretty good high energy video captured with this unit. It could use time lapse settings to capture mushroom and plant growth. I am looking forward to the evolution of this technology.